Earlier today, I was thinking about pink. Yes, the color pink, not the singer, Pink. Pink is such a lovely feminine color and Dunitz & Company often chooses to showcase beaded and fused glass jewelry in varying shades...of pink. There is always a following for pink. It hasn't ever been our best seller. (Anything blue is.) This was even the case when Pantone named "Rose Quartz" color of the year. Just the same, there are those that LOVE pink and we sell plenty of it. 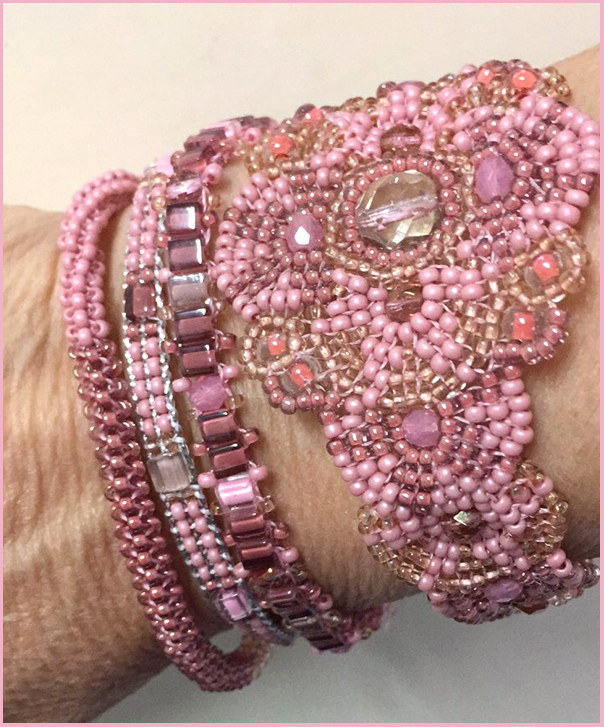 I was reminded of this recently when one of our followers on Instagram reached out to tell us just how much she loved our pink offerings. It inspired me to post this photo seen here to our Instagram stories on our ShopDunitz Insta page earlier today. Oops it's gone. So, here it is --- so you can see it. So what is the origin of the expression "Pretty in Pink"? Some say it's about little girls and how we tell them they are so adorable in their favorite color. Every little girl wants to be a ballerina. 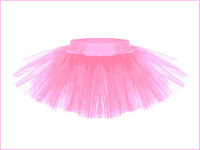 And it seemed most of the ballerinas I saw in Swan Lake, wore pink. I don't know if every little girl would rather have a pink tutu or a pair of pretty blush toe shoes. Perhaps these memories move 'grown up' women to adore pink in fashion. When I went online to research the origins of this expression, the thing that consistently came up was the 1986 movie starring Molly Ringwald and Andrew McCarthy. I'm certain this expression was used before 1986. I'm certain my father told me I was 'pretty in pink'. And as a non sequitur... Did you know Molly Ringwald hated her prom dress in the movie? How terrible is that? So there you go. This short post is only to let you know we're thinking about pink, the color. 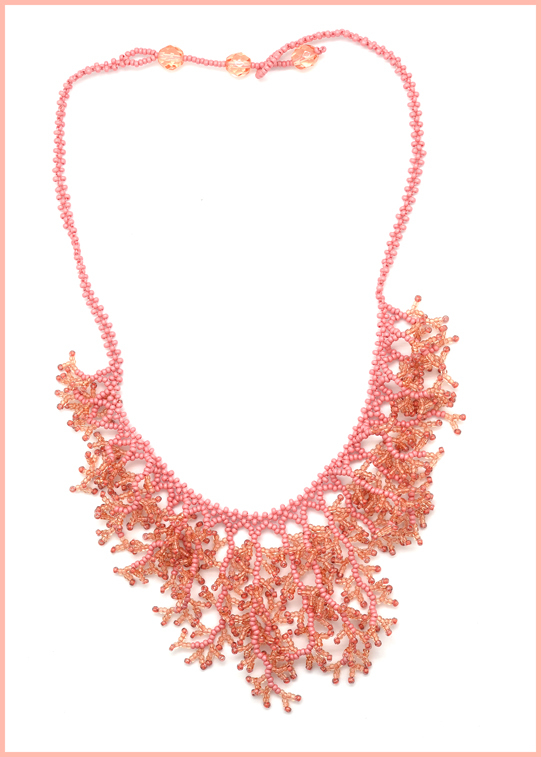 To the left is one of our oldest and most popular designs, our "coral necklace" (SKU: Ccoral1). And since the early 90's we've annually shown it in 24 colors (12 colors, 2x per year.) And you better believe, it's been offered in many shades of pink. Bubblegum, blush, champagne, rose quartz, cameo, orchid, pastel pink, baby pink, tango pink, hot pink, carnation pink, fuchsia pink, melon pink, cotton candy etc. etc. The photo to the right is from our current season. Do you want one? 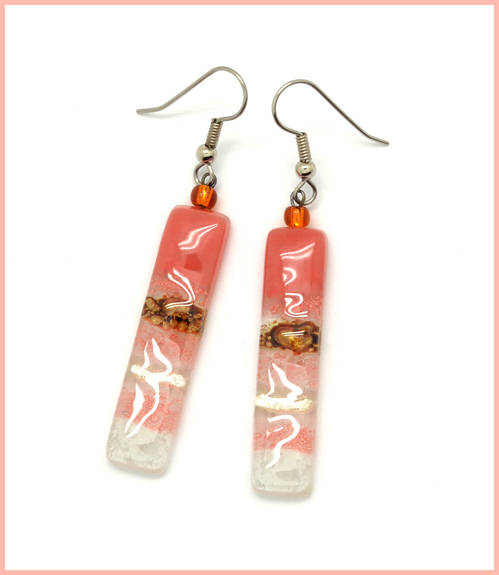 Since 2011, we've been showing our Joanie M fused glass collection. And you better believe we've offered these designs in pink too. 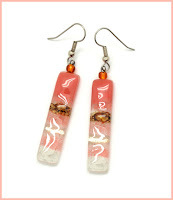 These earrings featured to the right can be found for sale on our retail website. We'll gladly outfit you with a bracelet and necklace to match. What do you say?